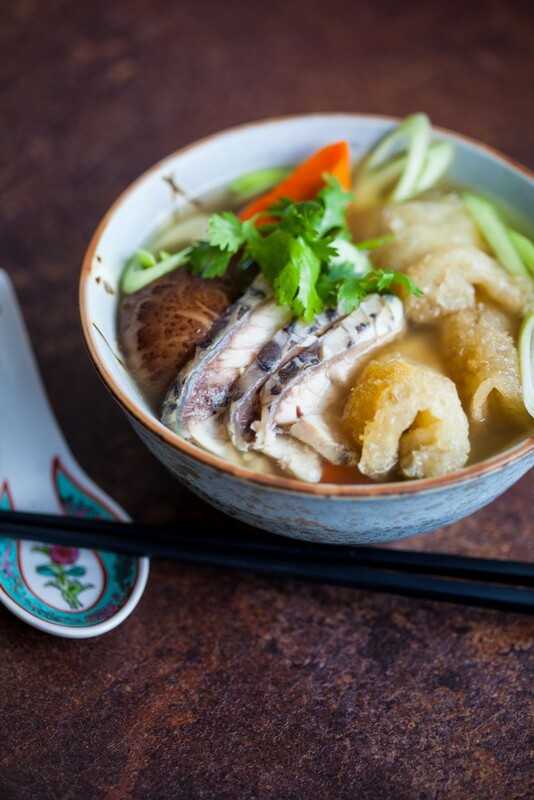 In celebration of SG50, here is a heritage soup that is enjoyed in Hainanese homes. Hainanese form a part of the population from China who migrated to Singapore. Most work as cooks for British families and hence the Hainanese are known to be good cooks especially the men in the family. They went to on to create many dishes that are Chinese but yet has a really rich colonial flavour. Some very well known dishes are : Hainanese chicken rice, Hainanese pork chop, Hainanese beef stew and the traditional eggs and kaya toast. Inspiration of soup: I remembered fondly of my childhood and growing up days where every festive occasion calls for a celebration feast, be it Lunar New year to Mooncake Festival to Dumpling Festival. There will be huge fanfare at home with the slaughtering of chicken for Hainanese chicken rice and fresh fish from the market. But I always will remember weeks before the actual celebration, my grandmother taking out her prized possesions of dried fish maw, sea cucumber, carefully reconstituting it, preparing it with precision and care. We will all sit down to have this meal together with cousins, aunts, uncles and often with the the Fish maw soup in the centre of the meal. Here, I have re created our family specialty adding the souper awesome and omega-3 rich barramundi fillets, hoping to bring a piece of my heritage and my childhood for all to enjoy. 120g dried fish maw ( Roast for 10 mins at 180 C followed by soaking 1/2hour before use) Slice into 3 cm to 5cm depending on the thickness you fancy. Should yield about 200g after soaking. 2X200g pieces fresh Kuhlbarra premium barramundi sliced about 2-3 cm thick marinated with 2 slices of ginger and a pinch of salt and a tsp of vegetable oil. Bring to boil the homemade chicken stock. Add in chopped round cabbage, ginger slices, shitake mushroom, coriander roots and carrots. Add the soaked and cut fish maw pieces. Continue to simmer for another 30 minutes till everything is tender. Add salt to taste. Add slices of the barramundi fillet to the soup. Add the thinly sliced leeks. The thin slices of barramundi should cook in a jiffy. Serve immediately with chopped coriander as garnishing. Tip: The barramundi fillet slices can be cooked separately in chicken stock and added to the rest of the soup to prevent overcooking of the tender flesh of the barramundi. The stock used for blanching the fillets can be added back to the soup.